It's a busy day at the "Cakes and More" bake shop! The mice get there first thing in the morning to open their shop. Then they chop, stir, ice, and bake their way to the end of the day. Fun characters pick up tasty treats and keep the mice on their feet. This is a fast-paced, easy-to-read book with memorable characters and sweet illustrations! Eric Seltzer lives in West Bloomfield, Michigan. Natascha Rosenberg lives in Madrid, Spain. 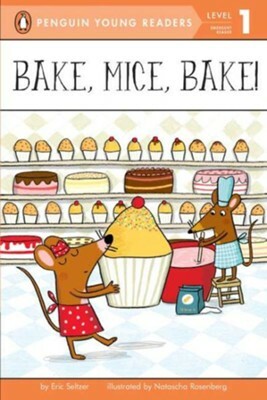 I'm the author/artist and I want to review Bake, Mice, Bake!.